What is the difference between LNA in Digital Manual Tuning and LNA (CH---) in Digital Set-up? 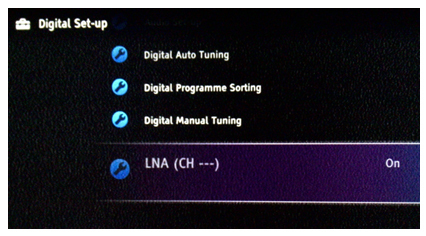 The difference between LNA in Digital Manual Tuning and LNA (CH---) in Digital Set-up. When manual tuning is conducted in LNA On, the channel scanned will be keep at LNA On for user viewing and you will see LNA (CH--) On. If we set default as OFF during manual tuning, the channel scanned will always stored LNA OFF & you will see LNA (CH---) Off. As a result the picture quality will not be at best level. User can change it and stored it independently for each channel. LNA in Digital Manual Tuning is applicable during Manual Tuning only. This is to ensure and encourage user conduct manual tuning in best signal strength/quality condition, it will always set ON every time entering Digital Manual Tuning manual. 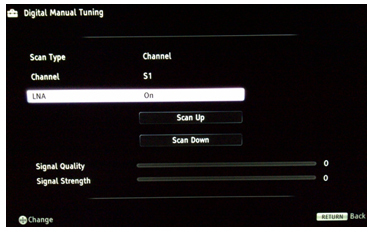 However there is OFF selection is user wish not to use the LNA function during tuning operation.